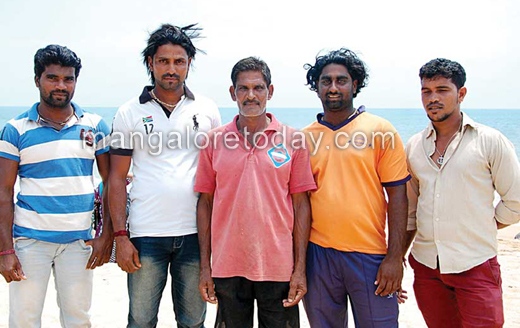 Mangaluru, May 18, 2015 :Three persons including an eight year old boy were rescued from drowning by the Lifeguards of the Shivaji Jeevarakshaka Eejugarara Sangha on May 17, Sunday. Those rescued are Sayyed Ibrahim, his son Sayyed Aslam (8) and their relative Firoze hailing from Nandini Layout in Bengaluru. It is learnt the three had come to the beach at Mogaveerapatna after visiting the Dargah when Aslam was washed away by the tidal waves. His father and uncle who rushed to his help also started drowning when the Life Guards plunged into the waters and rescued them. Lifeguards Dixith Karkera, Mohan Kotian, Sampath Amin, Kunal Amin, Nitin Putran and Niranjan Putran were part of the rescue operation. The Association had earlier decided not to involve in rescue operations following the May 10 incident wherein some lifeguards who requested a group of people not to venture into the sea had to face a police case and were jailed when the group falsely implicated them alleging that they threatened them. However, on Sunday the Association members who saw the three drowning decided to rescue them forgetting their earlier decision.